The season-opening ITU World Triathlon Abu Dhabi is just a week away and while it’s a chance to watch some of the superstars of the sport, there’s just as much space for the mere mortals to compete too. Sport 360’s head of content Chris Bailey is one such have-a-go hero who will be braving his first-ever triathlon, and indeed, first ‘endurance’ event since competing in a 10km run at Richmond Park in London a couple of years ago. 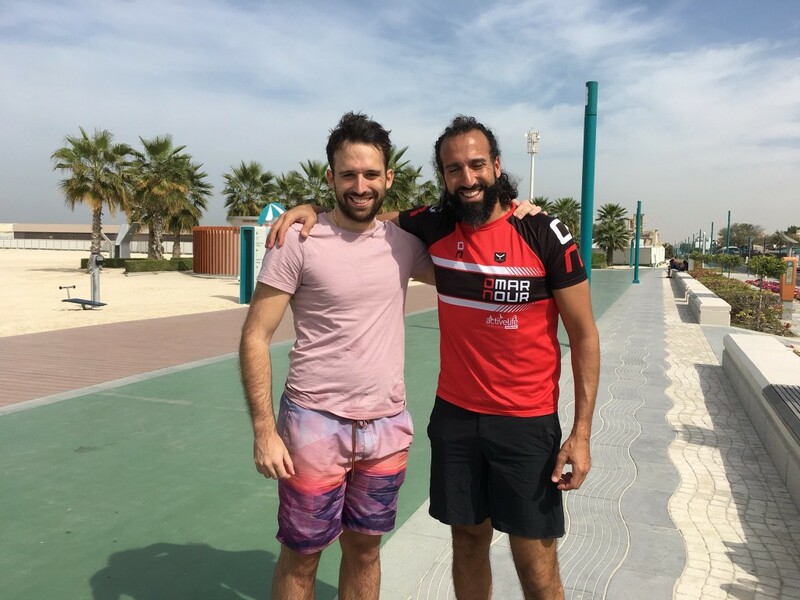 He’s left it rather late – confessing a 12-week plan has been condensed into just three – but recently turned to professional triathlete and well-known UAE personality Omar Nour for some tips on the water. In the open water it’s easy to get lost at sea when you haven’t got the luxury of cordoned lanes and a clear bottom like you do when swimming at your nearby pool. That’s why it’s important to check your sighting every 10 strokes or so to make sure you’re not drifting in the wrong direction. It’s not enough just to target the next buoy, as you could still drift and end up swimming many more metres. To enjoy the most direct route, pick out a landmark behind the buoy and keep them both in line. When checking, pop your head ever so slightly above the water so as to maintain your rhythm and a horizontal body position. 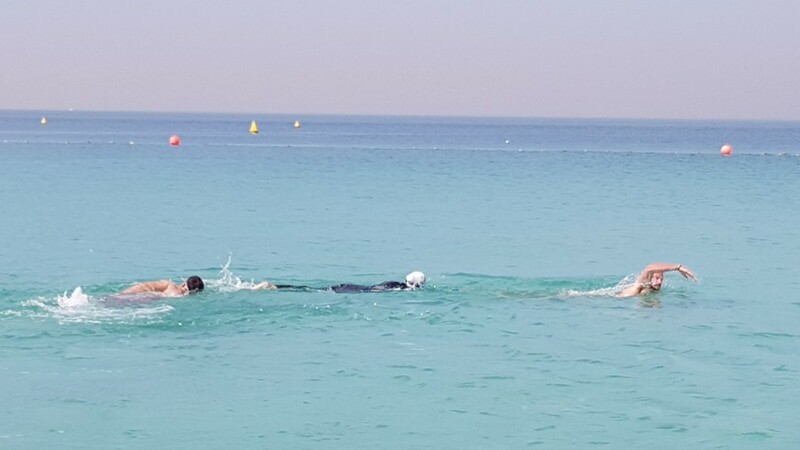 Make sure to look over the course map on the event website to memorise the turns or even better, attend the swim familiarisation on Friday 2 March from 11am. While there will be lifeguards on kayaks to help guide you if you go off course, each athlete is responsible – don’t blindly follow the people in front of you because they may not have paid attention during the race briefing! I’ve been told that different rules apply when it comes to personal space in the open water – that there are none. In fact, to maximise your gains there is every reason to expect and embrace the contact with your fellow swimmers. If you’re a first-timer (like me) then you’ll be most concerned about completing the course without the need for a lifeboat. It can get quite aggressive at the front as people fight for every small advantage, but there’s no harm in separating yourself from the pack. Start at the back or off to the side where you’ll have more space and smooth water to swim through. While everyone’s getting in each other’s way you’ll have a more serene, and hopefully more effective, swim. And though it’s a race there’s no rule against stopping and gathering your bearings for a few seconds if you’re uncomfortable. It’ll work out for the best in the long run. Online entries for the ITU World Triathlon Abu Dhabi between March 2-3 are open to the public via the race website, AbuDhabi.Triathlon.org, before registration closes on 27 February. Have You Ever Tried the Superman Workout?